Is employer’s liability the same as public liability insurance? The Autumn Budget 2017 has been revealed. What does this mean? Growth is lower than expected and productivity is still poor for the Autumn Budget 2017. Although, Hammond did not say why the economy will be slow for the next three years, chances are the uncertainty around Brexit has a big part to play. Initially at 2%, growth has been revised down to 1.5% in 2017. Forecasts for the years ahead are as follows: 1.4% in 2018, 1.3% 2019, 1.3% 2020, 1.5% 2021 and 1.6% 2022. This is compared to figures in March where forecasts were: 1.6% in 2018, 1.7% 2019, 1.9% 2020 and 2% 2021. Hammond said he is slowing down the pace of reducing the deficit in order for borrowing to reduce less rapidly than was initially forecast in March for the Autumn Budget 2017. Borrowing will be at £49.9bn this year, down from the previous estimate of £58bn. In 2018 it will be £39.5bn and down to £25.6bn in 2022-23. Good news for hard working tax payers as the personal allowance will rise from £11,500 to £11,850 in April 2018. The threshold at which the higher rate of tax of 40pc applies will also rise from £45,000 to £46,350 in April 2018. The changes will save the average basic-rate taxpayer £1,075 a year, Mr Hammond said. The Chancellor is set to double allowances for the Enterprise Investment Scheme (EIS) for “knowledge” businesses in the Autumn Budget in 2017, but he was quick to add that the enhanced perk would not allow the scheme to be used as a tax shelter for low-risk assets. Hammond also said he would bring forward the planned business rates switch from RPI to CPI within two years of April 2018 claiming it would save companies £2.3 billion. He added that 100% business rates retention will be trialled in London next year and after the next revaluation, future revaluations will take place every three years. He also announced measures to solve the “‘staircase tax” – extending the £1,000 discount for pubs with a rateable value of less than £100,000 for another year to March 2019. VAT registration will stay at £85,000 for the next two years. The Chancellor said that this would save most small businesses from a hefty VAT burden, adding that he also has plans to reform VAT rather than lower it. These announcements will greatly benefit small businesses in the U.K and encourage new entrepreneurs to launch new startups. This is a strong move ahead of Brexit. In an attempt to raise money from digital retailers to level the playing field between them and high street shops, royalties relating to U.K. digital sales that are paid to low tax jurisdictions will be subject to income tax from 2019 in a bid to generate an additional £200m a year. Another boost for technology sees £400m towards charging infrastructure for electric cars and those charging electric vehicles at work will not face taxes. However, electric cars are only driven by a small minority of people at the moment. For diesel cars, there will be a 1% point increase in company car tax and for cars that’s don’t meet standards – increase in tax by one band from 2018. Hammond promises that he is not hammering the white van man or woman and the increase in vehicle tax also only applies to new diesel cars, so existing owners will avoid being penalised as well. Fuel duty rise will be cancelled. This comes after Conservative MPs lobby against further rises in fuel duty every year resulting the chancellor has given in once again – at a time of rising petrol and diesel prices. Tolls on the Severn Bridge are also to be scrapped by the end of next year. Stamp duty will be abolished for first-time buyers on properties worth up to £300,000, or the first £300,000 of a property worth £500,000. Philip Hammond said the move would cut the tax for 95% of first-time buyers – and abolish it altogether for 80% them. The housing stimulus package involves £15.3bn of new cash for housing over the next five years, bringing total support for housing to at least £44bn over this period. Hammond has also pledged to push forward planning reforms to ensure more land is available for housing, and that better use will be made of underused land in our cities and towns. In a time where the U.K skills crisis is at an all time high, £204m of funding will be allocated for innovation and skills in the construction sector, including training a workforce to build new homes. This includes £34m to scale up innovative training models across the country, including a programme in the West Midlands and £170m of investment through the Industrial Strategy Challenge Fund. Hammond also stated he would inject £630m into a small sites fund to “unstick” the delivery of 40,000 homes and a new register will be created by the government stating all residential planning permissions from local authorities with the aim to improve information on where permissions are held and progress towards them being built out. 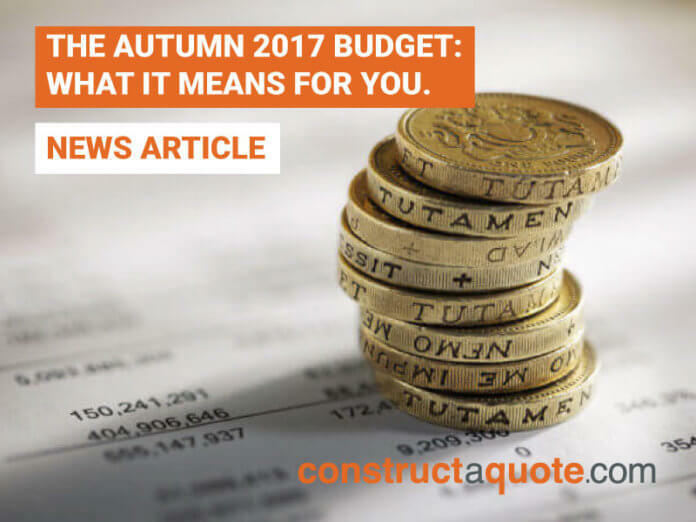 How does the autumn budget 2017 affect your business? 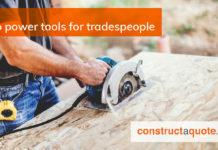 Feel free to reply or tweet us @constructaquote.